Available in a variety of sizes, all of Dean's art is available in limited edition signed and numbered giclee' prints. Utilizing the finest printing technology you will appreciate the high quality textured watercolor paper, combined with archival inks. Each print is signed and numbered by Dean in gold ink. You are going to love our 8 x 10" ceramic tiles. The process of transferring Dean's art to a cermaic tile is done through a process known as dye sublimation. It results in absolutely stunning colors. Each tile has a backing that is mounted with an easel for tabletop display or a clip for wall hanging - the option is yours. Each tile is signed by Dean. Tiles are available in U.S. only - no international shipping. We use the same dye sublimation process for our coasters and magnets as with our tiles. 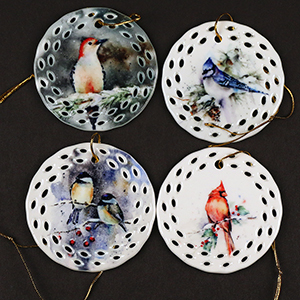 Each ceramic coaster measures 4-1/4 x 4-1/4" and has a cork backer. Individually packaged. Coasters available in U.S. only - no international shipping. Dean likes to think of his greeting cards as "little works of art." The first thing you will notice are the longer porportions compared to "standard" greeting cards. All cards are 4 x 9" in dimension and printed on high quality watercolor paper. Each card hand signed by Dean. Blank/no message inside, envelope included. These little beauties have the same vivid, beautiful color as our tiles and coasters. They measure 3" in diameter, gloss white with gold fabric loop hanger. Sold in sets of four (4). Includes gift box that has been signed by Dean. If you would like to mix and match, simply leave a message at checkout as to the names of images you would like.